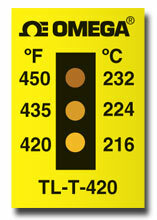 TL-T labels have three temperature ratings on a single label, which gives the user more information about the maximum temperature of the label. Use these labels to bracket the maximum temperature. TL-T labels are supplied 20 or 40 to a package. (pkg. 20) Temperature Range F° Model No. 참고: To order package of 40, add suffix “-40” to Model No.